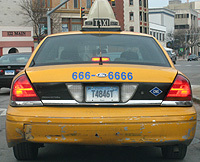 These plates are issued to taxis. This type started in 1931, with a "TAXI" legend. This type continued in an all-numeric format on various bases until the mid 1980s. Around the time of the introduction of the map base in 1987, a T1234T was used. Click the image to the left to see this type in use.